is a subscription based online software and collaboration solution hosted in the cloud. your IT and eliminates the burden of managing your hardware and software updates. At EverData, we provide Office 365 migration that is stress-free! 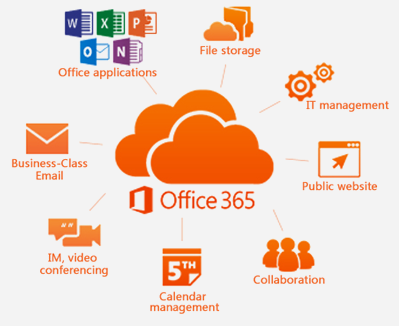 Wherever you may be, Office 365 can make files and applications available to you on almost any device with an Internet connection. It's a regularly-audited platform, with updated built-in anti-virus and anti-malware software, to ensure a safe and protected environment. Plenty of space for your files and applications that are stored online for content sharing with your team, calendars, and so much more. Easily log-in and access the user-friendly admin center from any place to manage all your services. No upfront cost for software that is often updated. We bill you on a flexible, per-use per-month subscription with your choice of plans to meet your needs. Your emails and files are always available. In the event of a natural disaster, you and your employees can easily access your business data with an Internet connection. Great for micro and small businesses, as well as startups seeking for collaborative web applications. Perfect for medium to large enterprises looking to upgrade their collaboration and team building tools and resources. Ideal for government agencies, offices, and units of any local or state governments or similar type of government instrumentality established by laws in India. Fitting for organizations and groups that has a recognized charitable status in India. © 2016 - 2019 Everdata Technologies Pvt. Ltd. | All rights reserved.